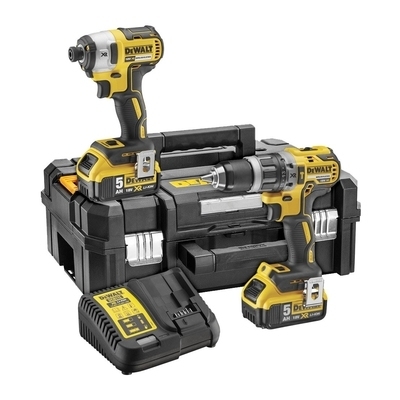 This amazing 18v cordless twin pack by DeWalt is made up of the DCD796 hammer drill, the DCF887 impact driver, plus a wide range of accessories including 2 5.0Ah Li-ion Batteries, 1 Multi-Voltage XR Charger and also a T-STAK Kit Box. The DCD796 XR 18v Brushless Combi Driver is part of the DeWalt Brushless range which provides unrivalled power plus up to 50% more run-time than previous DeWalt Combi Drills. Allows full control of applications with only 190mm overall length and 1.7kg in weight, perfect for operation in tight areas. Hight speed transmission with two easy change speed settings delivers faster application speeds, with egonomic soft grip handles to provide total tool control and balance. The DCF887 XR 18v Brushless Impact Driver can output up to 205Nm of torque allowing full control off applications - 28% more than previous DeWalt Impact Drivers. Built in PrecisionMode provides users with additional control for precision screwdriving without damage to work surface. The DCF887 features a New chuck design allows for quicker and easier bit changing.